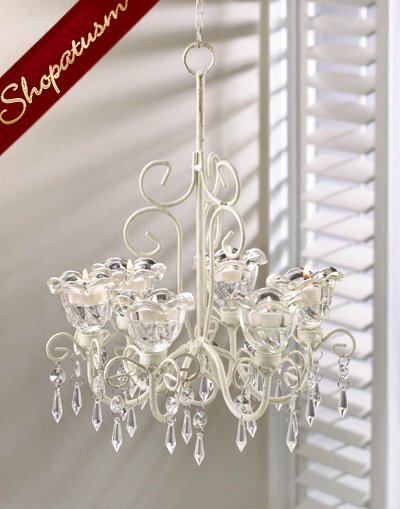 The ivory-painted metal framework of this deluxe candle chandelier features a weathered finish and curling flourishes that drip with faceted jewels. Place the candles of your choice inside the six candle cups and delight in the glow. Item weight: 2.8 lbs. 10 1/4 inch x 10 1/4 inch x 12 3/4 inch high; 12 1/2 inch long hook and chain. Metal and glass. Candles not included.